It’s time to take a look at one of the portable Shantae games. This one takes place after Risky Boots took away all of her powers so our protagonist is a little weaker than usual. She’s still as determined as ever though which is a good thing since the world is in peril once more. 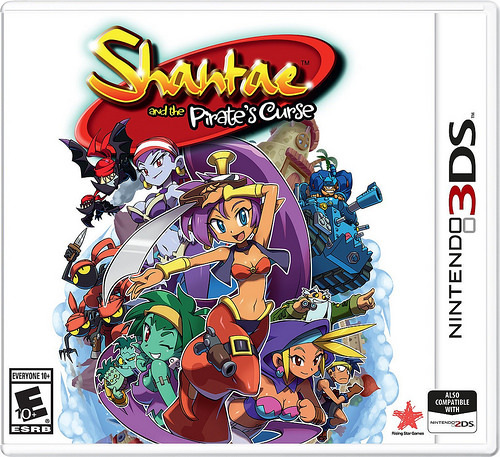 While the game isn’t quite as amazing as the PS4 one, it’s still a really fun game and proves once more that Shantae is one of the better side scrolling adventure games. Maybe she’ll be announced as dlc for the new Super Smash Bros at some point. The game starts out with Shantae still feeling the fallout from not having her powers, but she doesn’t have time to dwell on it as the Pirate King has awoken. He plans to conquer the world. Risky Boots has made it her mission to stop him and Shantae agrees to aid her. After all, Risky may not be her favorite person in the world, but she is still the lesser of the two evils. Shantae can worry about her after saving the world. To stop the King, Shantae must find his 5 Dens of Evil and destroy him, thereby weakening him enough for Risky to vanquish him. Does she have what it takes? The gameplay is a 2D platformer just like her last game. You try to get from the beginning of a level to the end to fight the boss. You can jump and swing your hair like a sword. A new power up can be obtained in each world like a gun, super speed, a sword that can stab through the ground, and much more. The game isn’t simply a matter of going from world to world though. Every time you get a power up you will want to go hack to the old worlds to see which new rooms can now be opened. There will also be old characters that you can talk to who are interested in items that you have obtained and will help you get through an obstacle. As such, remembering the story is certainly important for when the fans throws hints at you. It’s not as if the game is massive though so if you are unsure just go around and talk to everyone. I wonder if Risky Boots is officially going to be more of a rival than a villain going forward. While she may have been the main villain at one point, it’s rare to start helping the main character and then revert back. She seems like a pretty cool character so I’d be okay with that. Shantae is always a quality character herself and that doesn’t change here. She forgives Risky pretty quickly and doesn’t mind doing most of the work in stopping the villains. She has a lot of confidence and always gets the job done. While her trusting nature doesn’t always work out too well for her, Shantae keeps at it. Her supporting cast is definitely not quite as solid when it comes to the heroes. Shantae’s uncle is on the annoying side while her friend Bolo is too clumsy to be of help. The bird owner is a decent enough character and I actually thought her plot would have a sad ending with how suddenly the guy she was with got turned to stone. Well, it was still a sad ending for her but in a different way. Shantae’s zombie friend is definitely a big troll but she’s a fun enough character. Shantae definitely shouldn’t trust her all that much though. As always the game is very bright and colorful. The level designs really stand out and it’s usually pretty clear what you have to do. The attack animations are simple but very distinct. It just feels like a very modern portable game with a solid budget behind it. You’d be forgiven for thinking that it is a AAA title as the only thing hinting against this is the short length and to be fair, that’s something that happens to many big games as well. While the soundtrack isn’t quite as dynamic as the PS4 entry it is still quite solid. The themes have a quick tempo and really get you ready to tackle the level. There are multiple endings in the game which are determined by how many collectibles you obtain. There are 20 Dark Minions wandering the world and by destroying all of them and absorbing their darkness into your lamp, you can get the hero ending. I got most of them but clearly not enough so the game actually ends on a rather sad note. It even leaves room for a sequel if the true ending did not exist. The game makes it easy to find these collectibles though and it’s not like there are too many of them so grabbing all the pieces of evil would be a simple matter. There are also heart containers to obtain and even more upgrades to buy for your attack power and speed. Obtaining money in this game is certainly a slow process but a steady one nonetheless. With the replay value and main campaign the game will probably be about 8-10 hours which is reasonable. It’s a little short but still not that bad. Overall, Shantae has brought out another winner. The game is certainly very polished and the story is fun. The characters are very distinct and the game doesn’t reuse any bosses. There’s a lot to like here and I would definitely recommend the game. It was fairly close to scoring an 8 and an extra level probably would have sealed the deal. Regardless you will be missing out if you don’t get this one.